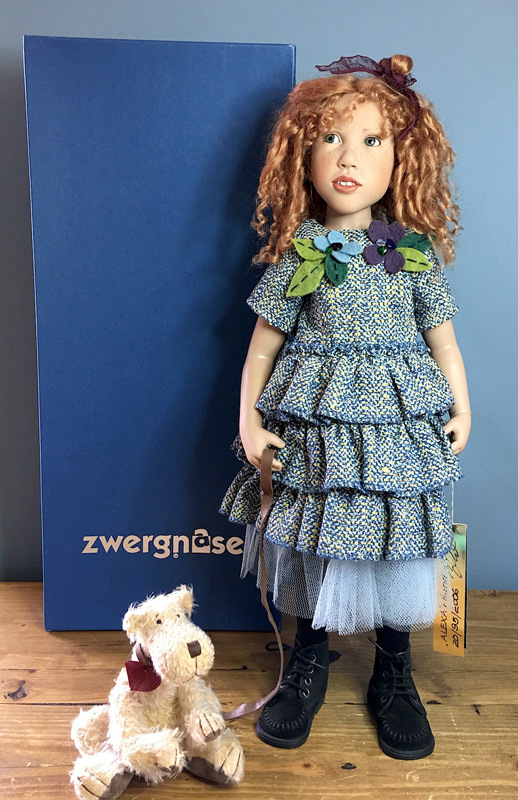 This Zwergnase Alexa with Hund (Alexa with Dog) is stunning with her riotous strawberry blonde curls, maze of freckles and toothy smile. 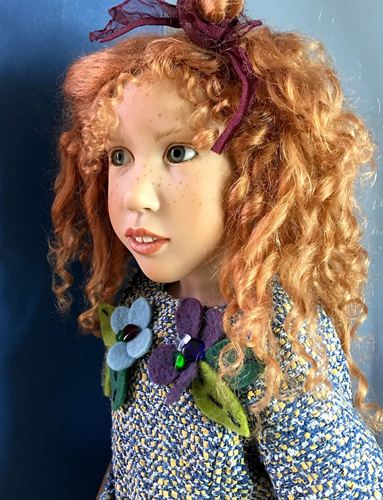 She is the creation of renowned German doll artist Nicole Marschollek-Menzner whose quirky sculpts epitomize the expressions of real children. 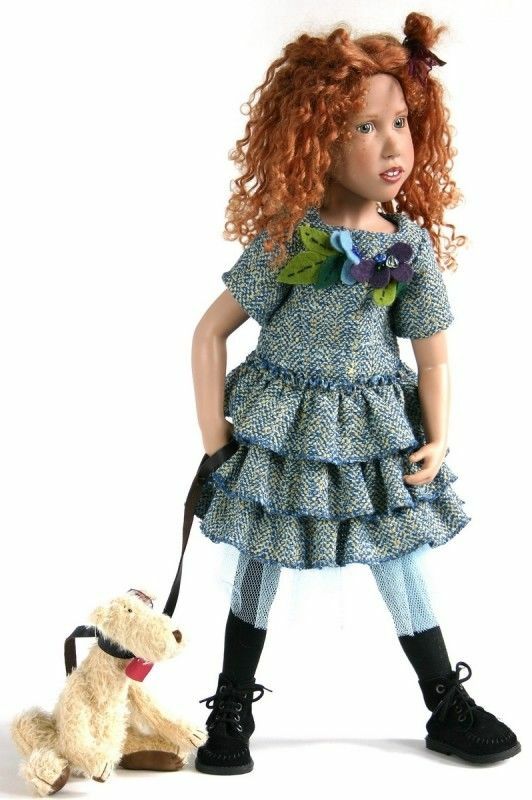 Alexa is a 21.5 inch tall 1-way jointed (head/neck) standing doll with vinyl head, arms, legs and upper torso and cloth lower body. 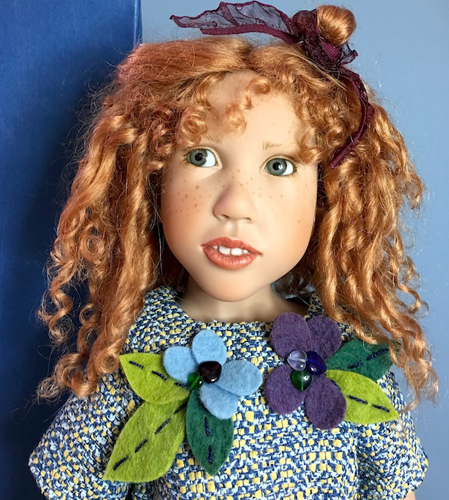 She has alluring blue glass side glancing eyes, curly strawberry blonde hair made of mohair, lots of freckles and teeth and and a playful expression. Alexa is wearing a drop waist dress of woven tweed fabric in various hues of blue with a three tiered ruffled skirt and floral accents made of felt. A long pale blue organza slip, white skivvies, black knee high socks and black suede lace up boots complete her outfit. Her limited edition number (LE#20/95/2006) is written on her lower torso along with the signature of artist Nicole Marschollek-Menzner as shown. She is ready for an afternoon walk with her dog. Included is the blue Zwergnase box and gold foil numbered hang tag LE#20/95/2006. Condition: New - Mint in box.